PT Bank Mandiri (Persero) Tbk - Bank Mandiri (IDX :BMRI) is a trusted and reliable financial institutions in Indonesia with core business competencies in general banking industry. Bank Mandiri is a state-owned company and is majority owned by the Government of Indonesia. At present, the Bank is 60% owned by the Government of Indonesia and 40% by general public. Bank Mandiri was formed in 1998 as part of the bank restructuring program of the Government of Indonesia. The Bank was formed as a merger result of 4 state-owned banks ; Bank Bumi Daya, Bank Dagang Negara, Bank Exim and Bapindo. The Bank is based in Jakarta and now has more than 1,086 branch offices, 1,724 units, 601 Kiosks, and 13 cash outlets spread in all over Indonesia (as of September 2017). Bank Mandiri's head office is registered at Jl Jenderal Gatot Subroto Kav 36-38 Jakarta 12190. 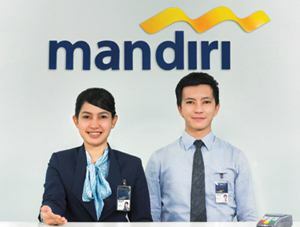 Bank Mandiri is recognized as the largest banks in Indonesia in term of total assets, loans and deposits. According to PT Bank Mandiri (Persero) Tbk Q3 2017 Analyst Meeting as cited by JobsCDC.com, Bank Mandiri registered total assets of Rp 1,078.70 trillion as at the end of the third quarter of 2017 (Q3 2017). Referring to its analyst meeting, total loans as of Q3 2017 were Rp 686.2 trillion. The Bank maintains total deposit of 761.49 trillion as of Q3 2017. Maximum age of 24 years old for Fresh Graduate and 26 years old for Experienced. Good looking, active and communicative. Honest, responsible and high morale. Maximum age of 24 years old for Fresh Graduate and 28 years old for Experienced. Have SIM C and own vehicle. JobsCDC.com now available on android device. Download now on Google Play here. Please be aware of recruitment fraud. The entire stage of this selection process is free of charge. 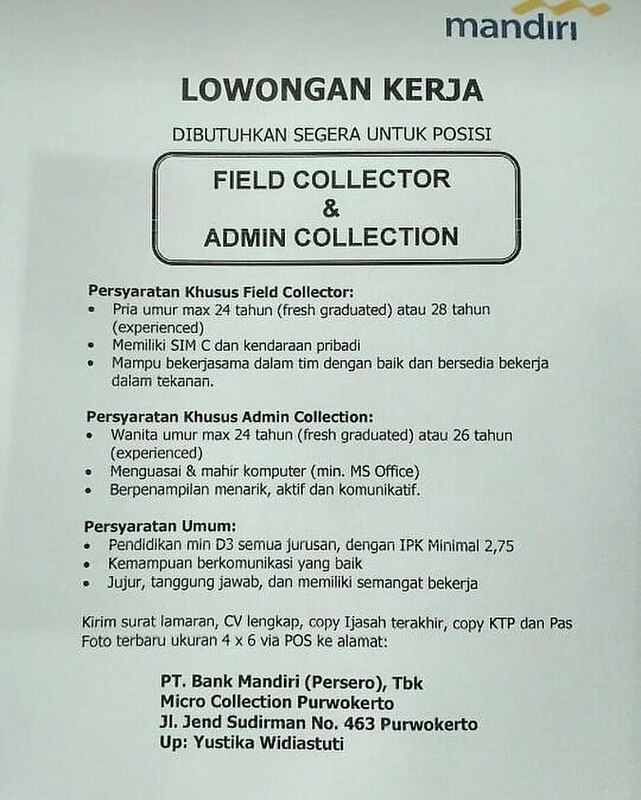 PT Bank Mandiri (Persero) Tbk - D3 Admin, Field Collector Mandiri March 2018 will never ask for fees or upfront payments for any purposes during the recruitment process such as transportation and accommodation.